« Launch of the Landmark Oasis Coquitlam Condo Tower by Onni Development Group – Central Coquitlam Condominiums for Sale at the Oasis High-Rise Residences – 38 Stories! KORE Vancouver Kits Condos – Spring 2010 Update! 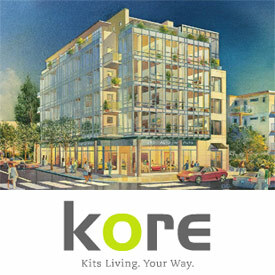 Give either one of us (Vancouver KORE Kits Condo sales team) to arrange a preview from our temporary sales centre (office of Macdonald Realty – Kerrisdale), and if you like what you see, we will then set up a KORE Living site tour thereafter. If you’ve been looking for a brand new Vancouver condo, don’t want to wait forever to move in, call now! Visit the Vancouver KORE Condo website to preview a ‘simulated virtual tour’ and peruse through the Kitsilano condo floor plans still available to choose from. Ken’s cell: 604.671.1025 or Kristine’s cell: 604.721.7080. Kitsilano Kore Sales Team, Macdonald Realty Ltd. The actual site of the KORE Kitsilano condo development is at 1808 West 3rd Avenue, Vancouver, BC. A sophisticated concrete and steel mid-rise Kits condo building located at Burrard Street and Third Avenue, the KORE Kitsilano condominiums are featuring its grand opening re-launch of sales this April 2010. Within easy walking distance to all the shopping, beaches and restaurants of the Vancouver Kitsilano real estate district, KORE Condos are liveable, functional and affordable for first time homebuyers and couples alike. Offering just 31 boutique Kitsilano condominiums for sale, the KORE Vancouver real estate development is for urban savvy homebuyers and boast luxurious finishing details to satisfy every purchaser. Most of the KORE Kitsilano condominiums for sale have incredible mountain, water and city views. For priority registration, please visit koreliving.com or call 604.671.1025. The presentation centre and display home for the new Vancouver Kitsilano KORE condominiums will be located at 2105 – West 8th Street. If you are looking for a boutique mid-rise Kitsilano condo for sale, the KORE Vancouver condominiums are a perfect fit for you. Located in one of the most desirable Kits Vancouver real estate locations, the KORE condominiums are not only centrally located in a hip and truly urban neighbourhood, but the finishes are unmatched by any other new development in the area. Boutique and luxurious interiors are great features of this mid-rise Kitsilano condo project developed by Toyo Developments in collaboration with WT Leung Architects and Lot 30 Design Inc (interior designers). The interiors of this boutique Kitsilano condos for sale are truly modern, beautiful and elegant. Functional floor plans with storage space and insuite laundry are other typical standard features here at KORE Vancouver condos for sale. Expansive windows, large open style kitchens, views from outdoor living spaces and a great finishing list of hardwood, granite and imported tiling are also standard in each boutique Kitsilano condo. Most homes will have balconies and those that do will have great views of the city and/or North Shore mountains. True West Coast living is available here and these luxurious finishes at the Kitsilano KORE condos in Vancouver real estate market also includes stainless steel appliances, deep soaker tubs, separate shower stalls, and the finest finishes you will find in this market. As Toyo Development says: Live in the heart of the action at the corner of Burrard and 3rd Avenue. Walk everywhere. To Kits Beach, trendy shops and restaurants, Granville Island, and the nightlife downtown. Your time is now and Kitsilano is the place to be. KORE Vancouver condos presents one and two bedroom Kitsilano condominiums for sale right now.